I was recently asked to give a talk at the Toronto Sound Festival on my TTSH build experience. And I’ll tell you, there’s no better way to get to know your gear than agreeing to stand in front of a room full of strangers claiming to be able to answer all their questions about it. So after having immersed myself in the manuals, online threads, vintage synth books, patchbooks, and music collections for a month or so, I thought a good (and long overdue) wrap-up to the series here would be a random brain dump of what I learned. This will sound obvious to you, particularly if you don’t have one yourself. But by the time I finished building it, I’d spent so much time in online forum threads and social media groups dedicated to sourcing parts, building, and troubleshooting the TTSH that I started to feel like I was the last one to get on the TTSH bandwagon. Honestly, I thought it was going to seem boring and passé by the time it was done. However, there were only about 1,000 TTSH panel sets sold (by my educated guess), and there will be no more. Which means there are still probably many more working ARP 2600s than TTSHs out there. There are at least two new clone designs on the way as of this post, by JMLS and VDD respectively, so maybe the feeling of specialness will fade. But it was fun to take it out into the real world and have it admired, even in the rarified setting of an electronic music convention. My first analogue synth was a Mono/Poly, which is a 4-oscillator (primarily) mono synth, so I’ve always been spoiled for oscillators. I had often wondered what the point of single oscillator synths, like the CS-10 or MS-10, was. I hadn’t really had any experience with the much-beloved SH-101 – coincidentally there was one at the festival – and its one oscillator sounds pretty huge. I was trying to come up with a looper performance that showed off the versatility of the TTSH, and triple-oscillator everything gets a bit dull after a while. Sometimes the mix calls for a single-oscillator voice. Good thing too, on account of the whole LFO business (more on that in a moment). I started the build thinking a clone of the 3620 keyboard would be a waste of time and effort, and that a MIDI/CV converter would be fine. And I’m quite happy with Peter Kvitek’s MIDI2CV board, which I installed in my TTSH. But the 3620 keyboard comes with a built-in LFO for pitch mod with independent speed, depth and delay controls; a pitch bend… knob? okay, I guess; a switch that transposes the keyboard up or down 2 octaves; a portamento control with momentary option for portamento on demand; and duophonic mode. That’s a ton of power. If you understand modular, you know how many modules that frees up. To duplicate the mod wheel effect otherwise, you would need to switch one of the 3 onboard VCOs into low frequency mode (so now you have a 2-oscillator voice, boo), then route the mod wheel CV output into one side of a VCA (or a ring modulator, which can also work) and the LFO into the other, then throw it into the mult if you want to control more than one VCO. Built-in portamento frees up your lag processor. Delayed vibrato? Good luck with that without an external VCA (though the MIDI2CV board, if you’re using one, offers this feature). People did, and continue to, clone the 3620, and as I’ve got a pretty robust eurorack system to augment the TTSH’s functionality I don’t really need to go down that rabbit hole. But if you didn’t have any other modular gear, it would be a pretty great idea. The original “lawsuit filter” in the earlier models was “potted,” which means it was a solid block of epoxy, making it somewhere between difficult and impossible to service. This has led to a lot of speculation that ARP was trying to hide their patent infringement from Moog. This is not only a pretty cynical guess, it also doesn’t make a lot of sense. If you had one in your hands, the potting isn’t going to stop you from getting in there if you really want to see what’s going on – particularly if you didn’t care if it worked when you were done. One of the ARP engineers from the time popped into one of the TTSH discussion threads to reminisce, and assured us that the potting was entirely for temperature stability. Considering he was not one of the original 2600 designers, and we’re talking about a disagreement that was resolved amicably 40 years ago, there’d be no reason for him to perpetuate some kind of coverup about it. By the time synth pop was really getting going, ARP was about ready to implode, and the 2600 had been around for nearly a decade. But the 2600 would have an influence far beyond its production run. I can’t believe it took me this long to put this together, but the intro to Fad Gadget’s Back to Nature (the second single from Mute Records, after Warm Leatherette) opens with what I’m certain is a slightly tweaked effects patch from the official ARP 2600 patch book. Dig it up and have a listen. 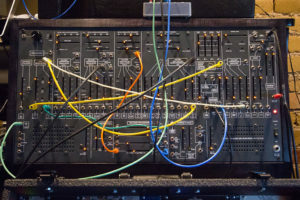 The patch was called “ARP Jungle.” Producer and Mute founder Daniel Miller, a.k.a. The Normal, must have run out and bought an ARP 2600 with the money he made off Warm Leatherette. Octave switches for the oscillators. I mean seriously, live patching is enough of a pain without having to tune these guys in using two separate sliders. CV control of panning. There’s really no point to a panning circuit without it. Sure, that means another VCA. You can’t have too many VCAs! A non-inverting voltage processor. What is it with the invertors, guys? Lose the invertor off one of the processors and maybe add CV control. So yeah basically I want another VCA for CVs here. LFO mode with keyboard tracking. Switching the VCOs to LFO mode disconnects the keyboard tracking, so they’re static. Maybe that’s how you’ll use them most of the time, but you can also defeat keyboard tracking with a dummy plug. It would be nice to have the option. Finally, almost precisely a year since I ordered the parts, it’s probably time to ease it back out of the spotlight and let it take its place among the other instruments in my studio. But first, here’s a demo I put together to show off some of its capabilities. Thanks for following along!